I remember my Great Aunt Rose telling me a story before she passed about a trip to Rome she took with my Great Uncle. Fettuccine Alfredo was named by an Italian restaurateur, Alfredo Di Lelio, at his restaurant Alfredo on the Via della Scrofa in Rome in 1914. My Great Aunt and Uncle were lucky enough to dine there and have Mr. Alfredo Di Lelio serve them his dish personally table side! She said he served all of the Alfredo in the restaurant with large gold engraved fork and spoon that were given to him by Mary Pickford! How cool is that??? Ok, so why the story? Well, I used to love fettuccine alfredo when I was a kid, but authentic kind that was just butter and parmesan cheese. So when I became a vegan I was always thinking of healthy ways of making this dish. Cauliflower was the obvious choice in vegetable for me to experiment with and I think I’ve developed a recipe that you’ll enjoy! It’s super duper creamy and dare I say actually pretty good for you! I’m serious, you will be blown away by how creamy it is! In my picture I’ve served this sauce with Bisogno’s vegan, gluten free, spinach pasta that I found at the farmers market today, but you can use this sauce in so many ways! I loooove it on a baked potato with some broccoli! It’s great in lasagna, potatoes au gratin, etc. Hope you enjoy! Wow! 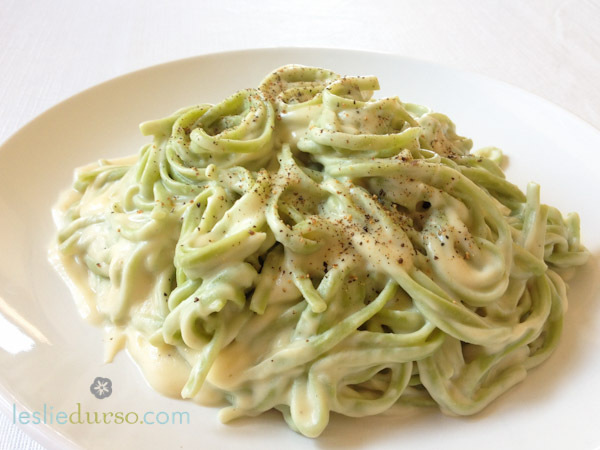 Leslie, we had your Fettuccine Alfredo with cauliflower last night and it was creamy – dreamy, unbelievably wonderful! Served leftovers today and my mother-in-law didn’t believe it was dairy-free. It was amazing. Thanks for a fantastic vegan recipe to keep me happy. And the best part was I didn’t have a fatty-food hangover, or messy clean up! Love ya! I love the description but it won’t allow me to print it. I can’t even copy and print it for some reason. Sounds delicious. I’ll definitely try it! It was also wonderful to learn Aunt Rose’s experience and the history of Fettuchini Alfredo from his own family! I also would like to be able to print this, or at least copy and paste into my word processor to add to my recipe binder. Thomas, I added a “printer friendly” link to the bottom of the post 🙂 I hope you enjoy! Oh my! I have to try this and it is on my list of recipes to try on my notepad! How about a Pin button, so we can upload it to Pinterest? This is going to be my favorite go-to recipe, thank you so very much. I love history, even more when it’s food related. By the way, Mary Pickford was a Canadian. I can’t wait to try this recipe! Fettucini Alfredo is one my favorites and I’ve seen many different vegan recipes for it, but never thought to use cauliflower! Such a great way to use my local veggies 🙂 thanks! My sister and i can’t wait to try this recipe. Unfortunately we live in Istanbul, Turkey and they don’t sell vegan butter here…do you think soy cream could be a suitable substitution? Just wondering what kind of onion you used? A white one or a sweet yellow one? Thank you in advance! Hi Meghan! I used a yellow onion, but you could definitely use a vidalia onion if that’s what you have on hand. I will definitely try this! Just wanted to say that I too, along with my parents, had the great experience of being served the famous fettucine by Alfredo himself at his restaurant in Rome, in 1956, when I was 16. I have never forgotten him, nor the golden fork and spoon he used to toss the pasta. Given that parmesan was a main ingredient, I wonder if adding some nutritional yeast might give this recipe a boost? I wondered too, but made it without and it was fantastic. WOW! I can’t wait to try this out! I’m talking about this on my show now. We made it last night …it’s easy and great!! !..best of all —- VEGAN!!! I’m so bummed I missed the show! I would love that you mentioned it! Thank YOU! This was amazing! I could have eaten it with a spoon, forget the noodles! Absolutely delicious and very easy to make. I had no trouble with the directions and made the slight substitution of more olive oil for the butter. This is going into my regular rotation of meals. Thank you! If well blended in less than 3 minutes is that okay ? This was so tasty and so easy. It makes a lot so half of it I added red pepper flakes and garnished with chopped fresh basil. Then the other half I added sauteed mushroom and peas. So glad you like it Toni! 🙂 Those sound like great add-ons! I LOVE this dish. I’m not vegan, but now I have another dinner in the quiver I can serve at dinner parties with my friends (vegans and non-vegans alike). I might also try it over brown rice instead of pasta for my gluten-free friends. So glad to hear that Holly! I am a brand new vegan. I made this recipe for my EXTREMELY PICKY, meat eating family and it was a HUGE HIT! Thank you, thank you, thanks. Pure awesomeness. My only regret is that I didn’t make more because I want some more, lol. So happy to hear this Jackie! Thanks for sharing!